A possible outcome of the abuse inflicted on the planet. Tigertron, in collaboration with Tantalus Media and Wicked Witch, announced Jupiter & Mars for PlayStation 4 with PlayStation VR suppport during the PlayStation Experience 2018 opening celebration. It will launch in May 2018. Jupiter & Mars is a game set in a near-future Earth that displays one possible outcome originating from the excesses and abuses we inflict on the planet today. You see, after moving back from Japan, where I was lucky enough to work at both Q Entertainment and Q-Games (unrelated to each other), I had just had my second child, a son. With two children in my family, I began to have serious concerns about the world they’d be growing up in. Plastics are found in nearly 90% of all the drinking water we consume, which leads to all sorts of health issues. We’re polluting our oceans at a prodigious rate that is unsustainable, and it’s possible that future wars will be ignited by a power-grab for the Earth’s remaining resources. I don’t know about you, but this isn’t the world I want for my children. So I pondered leaving the games industry and moving into conservation-related efforts. But while movies like The Cove and Racing Extinction made me burst into happy/sad tears, the work of legends like David Attenborough inspired me to stay. I thought “What can I possibly do to change things for the better?” The solution, to me and my partner Sam Kennedy (who I used to work with back in the day at places like 1UP and EGM), was not to throw everything I had learned in the past 20 years away, but to take that knowledge and find like-minded collaborators to create games inspired by and, in their own way, designed by nature. We figured if we can entertain people in that special way that video games can, and perhaps inspire them to educate themselves on a topic, then this would be worthwhile. Although it can be played on all PS4 consoles, Jupiter & Mars was designed for PlayStation VR. You don’t have to go to an alien planet to feel like you’ve visited one. All you need to do is go underwater, which is an entirely different world, with unique demands and creatures and ways of interacting. We sought to bring this element out in the game, to the point that Sam and I got certified in scuba diving while in Sydney, Australia, so we’d be able to bring that authenticity into the game. While Jupiter & Mars setting is inspired by real-world calamities, its gameplay draws inspiration from many of our past favorites, particularly Ico and The Last Guardian for the bond between their main characters. 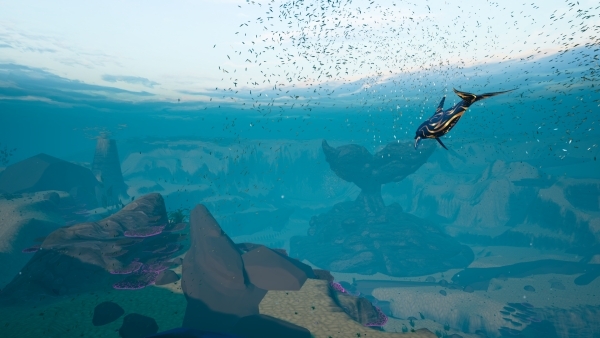 In the game, you control a dolphin named Jupiter along with your AI-companion Mars on an underwater adventure while you help restore life in the oceans. For those of you familiar with any of the games I’ve worked on in the past, you’ll find plenty of familiar elements represented here, too. Our fledgling studio, Tigertron, and the games we make, creates great opportunities to build relationships with and collaborate with some of the greatest talent in the world. We’ll have more announcements in the coming months leading up to the release of Jupiter & Mars, but we’re already working with composers like Jonathan Atkinson, who was a part of the legendary George Martin (The Beatles) production team. We went with Jonathan to London to record our theme song, and the voice that brings it to life is the incredibly talented Nami Miyahara, whose vocals you may recognize from Genki Rockets’ ‘Heavenly Star’ among others. As with everything I work on, music plays an integral, memorable role in the game, and while Jupiter & Mars is not a “music game,” it is musical. Last but not least, we are working with two great Australian teams to help bring Jupiter & Mars to life: Tantalus and Wicked Witch. It’s been great to work with a bunch of like-minded game creators to help us realize our vision of making games that branch out in new directions. We’re 100% committed to creating awesome games inspired by nature, so we may give back to nature, and will do so by donating a portion of our proceeds to organizations dedicated to preserving the planet for future generations to come. Just like my kids.